It’s kind of nice to play as an amicable dumb guy every once in a while. The Master Chiefs and Marcus Phoenixes are fine and dandy, but stepping into jiggly John Rochard’s unfashionable boots is something of a nice surprise. Everything from his southern drawl to his by-the-book mentality just screams “normal, ugly, and dumb” louder than our ex-girlfriends ever could. Which is why he’s the kind of character only an indie studio would dare create. But the protagonist is just a small taste of the many quirks of Rochard. Rochard is a colorful puzzle platformer that utilizes a somewhat stale premise - a group of unwitting and underperforming asteroid miners uncover one of the universe’s biggest mysteries. It’s a tale overflowing with betrayal and space puns, and while the deck is stacked against him, John Rochard has a secret weapon - the G-Lifter, which bears a striking resemblance to Half-Life 2’s gravity gun. The G-Lifter is Rochard’s bread and butter - a multipurpose gun that solves puzzles and ends enemies. It starts weak, only allowing you to pick up crates to toss at marauders, but you’ll find tool benches that upgrade your gun from a sissy crate hucker to a sticky-grenade-shooting, mass murderer-ing machine gun. This is almost too bad - killing enemies with boxes is much more fun (and emasculating, presumably), and the game loses a bit of its finesse when you can simply hold down a single button to end family lines. Picture Portal with a gun that can shoot grenades and you’ll get the gist. 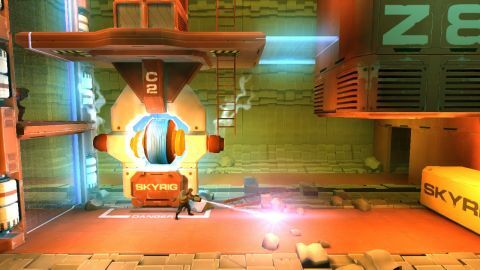 What the game lacks in shooter finesse it makes up for with awesome puzzles and superb platforming sections. Controls take some getting used to (all four shoulder buttons are used for a variety of different tasks, from crouching to changing gravity) but once you get the hang of them, traveling around is really rewarding. Halfway through the game you’ll be inverting gravity and swinging from rafters like Spiderman and Tarzan’s potbellied lovechild. The harder the puzzles the more fun they are, and other than a few infuriating exceptions the checkpoint system is forgiving. Good thing because between “doggonits” and “yeehaws” Rochard does a fair share of dying. At five chapters, Rochard is long and doesn’t pad that length with much backtracking. Each of the five chapters has beautifully diverse settings which offset some of the tedium of incessant puzzles. Pictures don’t do Rochard justice; it’s gorgeous and overflowing with color from beginning to end. If you’ve got free time and ten bucks to spare, Rochard is worth its weight in unobtanium (or whatever obscure space rock they were looking for before Rochard started shooting people in the head). Description If youve got free time and ten bucks to spare, Rochard is worth its weight in unobtanium. Or any other implausible space rock for that matter.